This Tuesday brings some piping hot new features from the webteam oven! Here’s what we snuck onto the site today. A page full of videos from artists you’ve listened to, with newly-uploaded stuff at the top so you always get the freshest content. Finally, eh? If you get enough emails promising that “bigger is better,” you start to believe it. Explore the softer side of Last.fm video with Fink. Embed our new tasteometer widget and anyone who wanders past your Myspace or blog can compare music taste with you. It won’t be as good as yours, of course, but whose is really. It’s compare…o…licious…ness. Until next time, I leave you with this photo of a Last.fm Toadstool, courtesy Wesley Mason’s Flickr stream. These are nice new features, but is there any reason subscribers aren’t getting them first? Any chance of a facebook version of the tasty new rate widget ness ? Cheers guys great updates too. We generally only do beta periods for major site updates, these are just small tweaks. 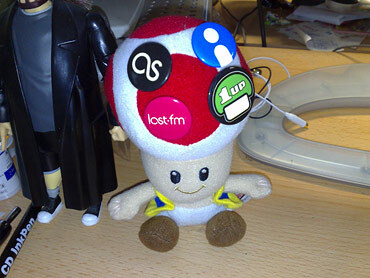 ..and is it me, or is that a Silent Bob figure standing next to your delightful last.fm toadstool? The mushroom person solidified it. Not entirely sold on the portable taste-o-meter yet, you have to type in at least four or five artists for it to return an accurate match. But I’ll grant that you lot just rolled it out, and thre’s probably still some tweaking left to do. So cheers for the work so far. I love the video clips, but they don’t come up as played tracks. Is that feature coming? It’d be great to watch video clips and get them tracked. One day maybe we could watch our own customized video clip webtv channel? I could see that being limited to lastfm subscribers. can anyone explain how the taste-o-meter works? For instance i have a low with people with whom i share 7 out of their top 10 in my top ten…. I’ve got the feeling the taste-o-meter isn’t exactly full-proof because of its taking into account a lot of stuff that you don’t really listen to but sometimes comes around…or am I completely wrong about that? 1. any chance to switch between old Taste-o-meter and new on my page? 3. but idea is great!! Yep, that is a Silent Bob figure. would love to get my hands on some last.fm buttons or stickers.. I can’t see the videos because they use Flash. Can you guys make mpg videos available alongside the flash ones? The only relevant question following this great news is of course: where can I get my own last.fm badge? OMG do you seel last.fm t-shirts?! OK the recommended videos is AMAZING. Throw in some ads between clips and I think you have yourself a business model! Like MTV of the 80s only personalized!!! I like the video recommendations. I don’t see the point of a larger video when the quality of the videos is not there. Too pixelated for my taste. Other that that I think the video feature is great. 1) I love love love the video recommendations! I really and desperately want a badge or a bumber sticker…they look awesome..I think I’ll have it custom made for me.